Standard Chartered Plc, which lost almost $200 million from a fraud at Chinas Qingdao port two years ago, has teamed up with DBS Group Holdings Ltd. to develop an electronic ledger of invoices that uses a parallel platform to the blockchain employed in bitcoin transactions. Lenders such as Bank of America Corp. and HSBC Holdings Plc say theyre looking at blockchain for trade finance and other banking applications. 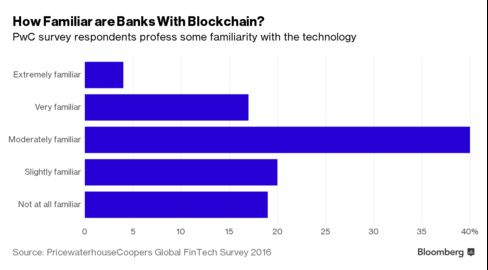 Blockchain proponents argue that the technology will change the face of banking, helping lenders cut billions of dollars in costs. 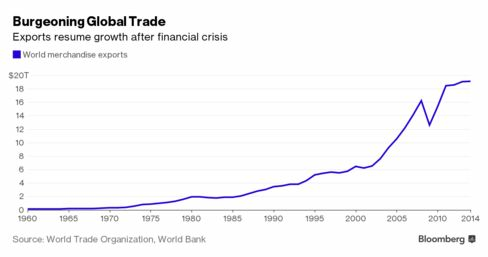 Trade financing, a centuries-old banking mainstay, may become ground zero for blockchain adoption because it promises to do away with paper invoices and the fraud that accompanies them — if banks can come together around a joint platform. For blockchain applications, invoices should be considered a leading candidate here, given the high potential for fraud, said Henry Balani, global head of strategic affairs at Accuity, which provides technology to monitor trade-based money laundering. Lenders typically dont publish their losses from trade fraud, though almost 20 percent of banks in a 2015 survey by the International Chamber of Commerce reported an increase in fraud allegations. In the Qingdao case, companies controlled by a Chinese-born, Singaporean businessman are alleged to have used invoices for the same metals stockpiles several times to bilk banks out of hundreds of millions of dollars. Standard Chartered wrote down $193 million in commodity assets in 2014 because of the incident. In another example, a trans-Atlantic fraud conspiracy that used fictitious purchase orders and fake invoices to get loans for metal shipments was estimated in 2008 to have cost banks including JPMorgan Chase & Co. close to $700 million. Because there is no common platform for banks to screen transactions financed by other banks due to confidentiality concerns, there is a possibility that customers may capitalize on this information-sharing gap to obtain financing from multiple banks using the same invoice, said Lum Yin Fong, one of the DBS executives who oversaw the banks ledger tie-up with Standard Chartered. The banks conducted a trial late last year — code-named TradeSafe — that used a shared ledger of as many as 60 mock invoices, according to Gautam Jain, Standard Chartereds global head of digitization and client access for transaction banking. Details from an invoice are used to generate a unique hash value stored on the ledger, which appears if another bank tries to register the same details separately, according to Jain. HSBC and Bank of America said in separate e-mails theyre involved in a number of blockchain projects including applications for trade finance. Citigroup Inc., meanwhile, said its in the early stages of exploration to assess how the technology can help in treasury and trade. None of the banks provided any specifics. Despite the incentives, blockchain will only be able to solve the fraud problem if banks agree to club together to use the central registry, according to Liew Nam Soon, Ernst & Youngs Asean managing partner for financial services. There has always been a culture of competitiveness and challenges in banks working together on large-scale projects or involving more than a handful of banks, Liew said. There is evidence, however, that this is changing with the current digital disruption in the industry, compelling many banks to collaborate. The issue for any collaboration on a distributed ledger is getting participants to agree on common standards in adopting the same invoicing platform. For example, the number of data fields from an invoice that will be used to generate the hash value for the blockchain will need to be negotiated with the different banks, Standard Chartereds Jain said. Banks will also need common messaging standards, according to Accuitys Balani. The challenges are related to agreeing a common process and ensuring that a single operating system can be adopted for all, said Owen Jelf, the London-based global managing director of Accentures capital markets practice. Think of it like putting seven people who speak seven different languages in one room to try to settle a problem, in this case how to settle a trade finance transfer. Standard Chartered and DBS are working with the Infocomm Development Authority of Singapore, a government agency that seeks to advance technology and telecommunications, to promote the distributed ledger used in the TradeSafe trial. The IDA aims to commercialize the technology and is in discussions with other banks, a spokesperson said in an e-mailed reply to questions, declining to provide names or a timeline. We need committed partners, the IDA said. Trade financing is borderless and banks that do adopt this technology will be able to benefit regardless of the country of origin.